Directed Light is proud to have our President Neil Ball to be Chair at LME 2016 Ask the Expert. As a long time LIA member and supporter, Directed Light is honored for the opportunity to share our knowledge and experience of Laser applications within the Industrial, Medical and Scientific industries. Need a quick answer about what types of lasers will be the best fit for a particular application? Do you want guidance on what components you need to build the most efficient production system? LME’s Ask the Expert booth, right on the exhibit floor, is the place to go for help. A rotating cast of industry experts from the top laser makers and system integrators on hand at LME will assist you on the path to profitability. With dozens of LME exhibitors at your disposal, the experts at the booth can point you in the right direction so you can network immediately with the people you need to meet to get your job done — and done right. Jimmie Bates, Altos Photonics, Inc.
Joel De Kock, PRECO, Inc.
Gil Haas, Haas Laser Technologies, Inc.
Thomas Kugler, Laser Mechanisms, Inc.
Dale Sabo, SCANLAB America, Inc.
9:00AM – 10:00AM Rob Mueller – NuTech Eng. 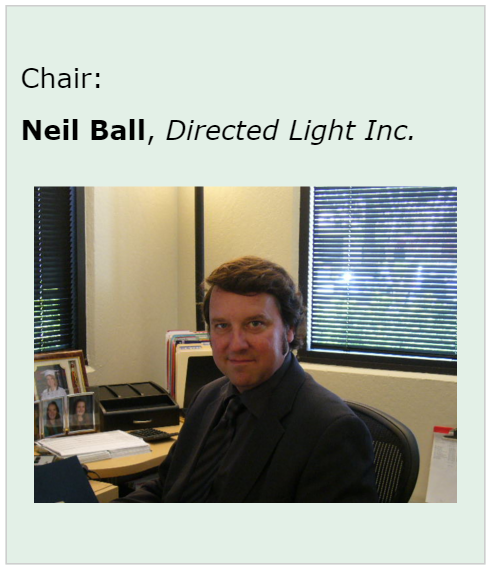 Neil Ball – Directed Light Inc.
9:00AM – 10:00AM Neil S. Ball – Directed Light Inc. Gil Haas – Haas Laser Technologies, Inc.
10:00AM – 11:00AM Daniel Capostagno – SPI Daniel Robinson – Weil Eng. 3:00PM – 4:00PM Neil S. Ball – Directed Light Inc. Rob Mueller – NuTech Eng.